DESCRIPTION This home is a must see! located in one of the most popular communities in Calgary, this executive lakeside access home is steps away from the main beach. With over 4000SFT of living space this house includes many upgrades. The large kitchen has been fully upgraded with stainless steel appliances, a huge island with beautiful granite countertops and raised cabinets. The main floor boasts an elegant front entry, a great room with high volume ceilings with wood beams and hardwood flooring throughout. A good size den and mud room complete this level. The top floor consists of three good size bedrooms all with walk in closets, laundry room, huge bonus room and a masters suite with a free standing tub and custom shelving in the masters closet. The basement has been finished, it includes a wet bar and 3-piece bathroom. Outside has been landscaped with a deck, patio and dog run. Triple car garage provides ample parking. Home for sale at 49 Masters Ld Se Calgary, Alberts T3M 2B2. 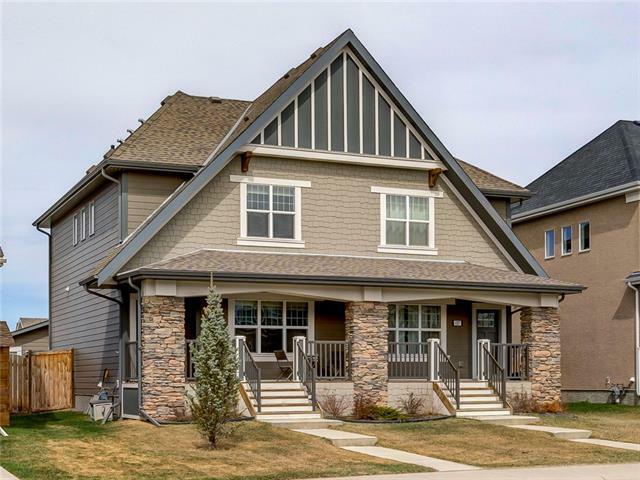 Description: The home at 49 Masters Ld Se Calgary, Alberta T3M 2B2 with the MLS® Number C4222660 is currently listed at $939,000.